Footscray has many attractions however its riverside does not seem to be one of the better-known ones. I have friends who live two blocks from the Maribyrnong River in Footscray yet have never been there. So here's a taste of what you can find along the river banks in the Footscray area. It's a fascinating fusion of the urban and the rural. A walking and cycling track runs alongside the river, marked with a broken red line on this map. Starting from the river banks at the end of Parker Street if you head South you will come to the Footscray Wharf. Most of the attractions however are to the North. The first place of interest is the Footscray Community Arts Centre on the left and then the Blackbird dock on the right. If you'd rather not walk or cycle, you can take a cruise up or down the river on the Blackbird and enjoy an expert commentary on the river and its history along the way. The trail then winds past myriad peppercorn trees and views of the city along to the Heavenly Queen Temple. This temple has been under construction for quite some time and over the years there have been periods where it was possible to visit. At the moment though there is further construction underway. A little further down the trail is Newell's Paddock. While you can't wander through the reserve, even over the fence you can appreciate this very inner-urban sanctuary that provides a rare habitat not normally seen so close to the city for birds and other wildlife. Footscray Park is the next major attraction. Photographic opportunities abound with river and city views and the beautiful botanical gardens. There are barbeques, fishing platforms, a couple of shelters and toilets available in the park. On the other side of the river from Footscray Park is Flemington Racecourse. Footscray Park is known as a good spot from which to watch the city of Melbourne's New Year's Eve fireworks. Adding to the celebratory atmosphere, last New Year's Eve the council provided a fireworks display at Footscray Park. . 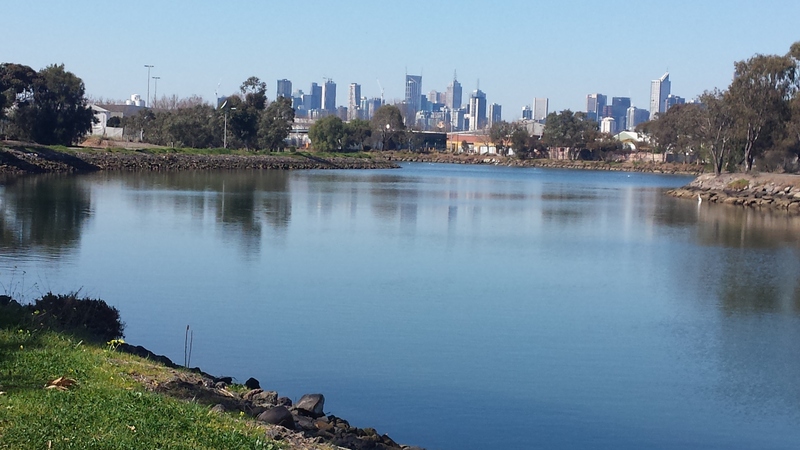 Continuing on you come to Victoria University, the Footscray Boating Club and the Edgewater Wetlands and Lake. Further up the river there are more attractions such as the Anglers Tavern and Pipemakers Park. To enjoy the riverside in Footscray you can start from anywhere there is access to the river. Car parking (free and ticketed) is available along the river near Victoria University in Footscray, in the streets around the Footscray Wharf and a few spots in between. For somewhere to eat, there is the Happy River Café at the Footscray Community Arts Centre, Victoria University Footscray Park has several cafes and a bar or you can bring your own picnic. If you're interested to find out more about the river itself, Melbourne Water has produced a great guide which features the history of the river and all about its wildlife. The river bank is likely to change in the future, the council having recently set out their plans for further improvements. The ark looks very nice. Great pictures. Some new places to explore when I'm next in Melbourne Janice. Thanks! Love your photos. why didnt you go as far as Canning Street Tea gardens. There is a reproduction of the White Lady statue and good playground and bbqs. Hi Janice! Great walk! You could map your walk and great pics at Victoria Walks "Walking Maps"http://walkingmaps.com.au/ a FREE site to create and share your favourite walks!